Lettuce is a Cool Season Vegetable (Salad Greens, Lactuca sativa from Asteraceae Family). Not native to North America - Mediterranean origin. Was cultivated by Egyptians 6,500 years ago. With the variety of colors, shapes and flavors available, your salads may never be the same. Lettuce is adapatable to many growing conditions, but likes it cool - around 60 F to 65 F. Grow in spring and fall, and slow bolting by shading summer crops. Sunlight: Yields best in full sun. Part shade helpful when it’s hot. Will withstand light to moderate frost. Lettuce grows great indoors, or outdoors, in simple Kratky hydroponic containers. Black Seeded Simpson lettuce in SIP. Propagate by seed. Best germination is below 70 F. Days to emergence: 7 to 14. Germinates in about a week at 50 F, 2 days at 70 F. It may fail to germinate if above 85 F.
Direct seed or transplant in early spring, as soon as you can work the soil. Direct-seeding: Sow seed 1/8 inch deep, 1 inch apart in rows 12 to 18 inches apart. When plants have two or three true leaves, thin to 12-inch spacings for crisphead varieties, 6 to 10 inches for other types. Seeds need light to germinate, so do not plant too deep. Make succession plantings every week or two. Lettuce has a shallow root system. Keep soil moist to keep plants growing continuously. The numbers 5-10-10 or 10-10-10 refer to the percentages of nitrogen (N), phosphorus (P) and potassium (K) in the bag of fertilizer. They are always listed in that order, too: N-P-K.
Plants need more than just 3 major plant nutrients to grow normally. Secondary plant nutrients, such as magnesium, zinc and iron, are also important, but usually needed only in small quantities. Most soils contain these minor elements, but mixing compost or other organic matter, such as composted manure, into the soil helps to insure their presence. Alternatively, you can add rockdust or Azomite. Toss the fertilizer over an area as evenly as possible. You don't want to get a lot of the commercial fertilizer or dried manure in one place. Always mix the fertilizer into the top two to three inches of soil before planting. “Up, Down and All-Around” is another way to think about NPK and the numbering system for fertilizers. Your lawn needs nitrogen for the leaves’ color and growth, phosphorous for strong roots, and potassium for overall health. Source: Home Depot. HEIRLOOM. Even after 150 years it's one of the most tender leaf lettuces. Hugely popular for over 150 years, it's one of the most tender and delicately flavored leaf lettuces ever bred. The ruffled leaves are large with an appealing green color. 'Simpson' is well adapted to a wide range of climates and is still the best for early spring sowing. Burpee Exclusive, popular looseleaf blend, selected for a long harvest. Fast-growing, tender, colorful, and tolerant of hot weather. Grows best in cool weather. Can also be grown as a fall crop. Protect from heat with shade cloth. Likes fertile soil, ample water. Best when picked minutes before your meal. Space lettuce plants 8" apart. 500 seeds per packet, will plant about 30 ft of row; one oz. sows 400 ft. Grows best in full sun. - Looseleaf (var. crispa) - Easy to grow. Matures quickly. You can start harvesting leaves as soon as 4 weeks after planting. Great for early-season plantings. Wide variety of leaf shapes and colors. 45 to 60 days to full maturity. - Butterhead (bib, loosehead, Boston) - Exceptionally good flavor and quality. Forms loose heads with oily leaves. 55 to 75 days to maturity. - Romaine (Cos, var. longfolia) - Upright, elongated heads. (Some grow nearly 2 feet tall.) More tolerant of warm weather and less likely to bolt than other lettuce types. Red varieties as well as traditional light green. Most take about 70 days to mature. - French (summer crisp) - Midway between butterhead and crisphead. You can harvest early like leaf lettuce or wait until heads form. 50 to 75 days. - Crisphead (iceberg, var. capitata) - The familiar spherical heads found in grocery stores. Most difficult varieties to grow. Requires long cool season. Will bolt quickly in response to stress. 75 or more days. Here is his recipe for success: There are 6 holes drilled in the bottom of this storage container ($4-8 at Walmart/Target, etc. ), each about half inch wide. Water on once a day at 6 pm. Sometimes lift the container to get an idea of how much water is in the soil. Water with fertilizer solution once every 7-10 days, e.g. fish emulsion fertilizer 5-1-1 mixed 1 tablespoon﻿ per gallon. 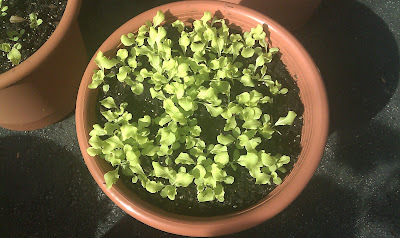 I'm surprised you didn't mention that the leaf lettuces regrow. 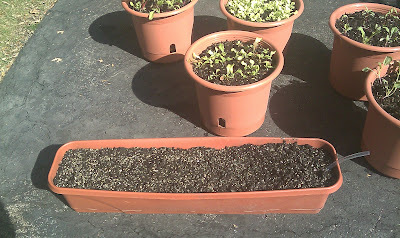 If you plant the seeds fully across the pot, very close together, you can thin them a little and eat those, but also, still leaving them fairly close together you can just cut all of the tops off like chives, and they will grow back three times at least. After the third time you can reseed. It's the easiest and most productive way to grow salad at home, and many high-end restaurants that grow some of their own fare use this method.